Three Hope volleyball players have been named to the Great Lakes All-Region team by the American Volleyball Coaches Association (AVCA). The team recognizes NCAA Division III players from colleges in Kentucky, Michigan, Ohio and Pennsylvania. Senior setter Greer Bratschies of Grand Rapids (East Grands HS) is being honored for a third consecutive year. Named for a second consecutive year is sophomore outside hitter Jenna Grasmeyer of Hudsonville (Unity Christian HS), and a first-time honoree is junior middle hitter Mari Schoolmaster of Portage (Portage Central HS). In addition, senior libero Jessica Maier of Grandville (Jenison HS) received honorable mention recognition. The All-Region honorees become eligible for All-America consideration. The All-America team will be announced when Hope College hosts the NCAA Division III championship from November 15-17. Hope's 10th annual Relay for Life held November 9-10, 2012 raised $45,488 for the American Cancer Society. 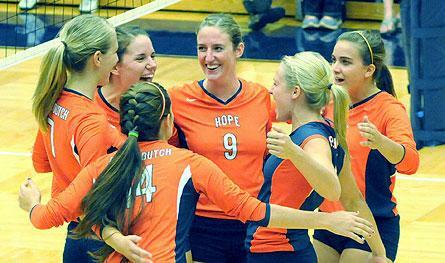 The NCAA Division III women's volleyball championship has come to Hope's DeVos Fieldhouse thru Saturday, Nov. 17.